Document .Net - create, read, write and edit PDF, DOCX, HTML, RTF and Text documents in C#! Document .Net - create, read, write and edit documents! 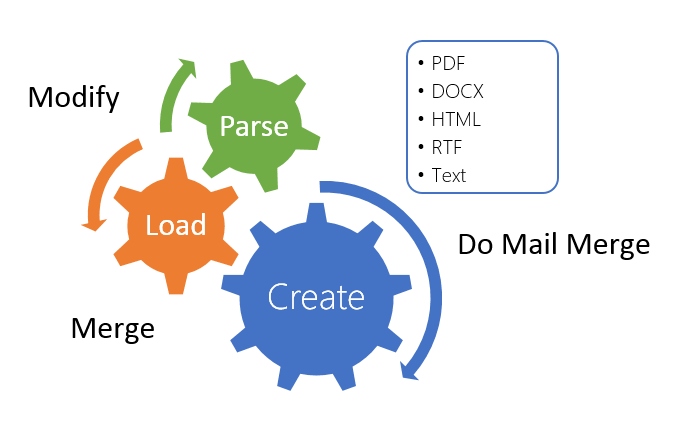 Read and Write: PDF, DOCX, HTML, RTF, Text. Create, Read, Write, Edit, Merge, View and Convert documents in PDF, DOCX, HTML, RTF and Text formats. Single Programming Interface for multiple formats: DocumentCore (DOM). Gives you API to operate with: Sections, Paragraphs, Tables, Bookmarks, Hyperlinks, Fields, Text objects, Headers and Footers, Shapes and Vector Graphics, Forms, Formatting, Images, Lists, etc. Create PDF signed by a Digital Signature. Rasterize a document to Image. Render a document to WPF. .Net Framework and .Net Core. Works in Asp.Net, WinForms, WPF, Azure. Only single dll: SautinSoft.Document.dll, 6Mb. New versions every one month (HotFixes).